This 8x40 is a nice instrument to hold and not as heavy or bulky as the other "x50" Fieldmaster models. It is ideal for taking walking or even for use at the races. 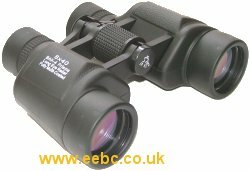 All feature BaK-4 prisms and multi-coated optics and have fold back eyecups for spectacle wearers, tripod bush (requires L shaped bracket to mount to tripod) are supplied with strap and case and have a 1 year manufacturers warranty. 28/11/2006 11:01:41 Are these binoculars rubber covered and thus would they then be a good long term buy for a lad of 10 years of age? 28/11/2006 11:17:55 Yes, the Helios Fieldmaster range are all rubber covered. 18/03/2007 20:32:21 are these binoculars suitable for a lady? 19/03/2007 11:24:27 The Helios Fieldmaster 8x40 are fairly small and lightweight and would be ideal for anyone with smaller hands. At shows when people can have a good look and feel of the binoculars, we have sold many pairs of these binoculars to ladies. I am planning to go to Africa next year and was wondering if these binoculars would be suitable for looking out across the savannah and observing the wild animals? I am looking for a good focus over a long distance. 12/05/2008 13:42:45 The Helios Fieldmaster 8x40 would be an ideal choice for wildlife observation in Africa, they are quite light to carry and have a good image. The only other ones around this price range I would consider would be the Visionary Wetland as they are waterproof and have internal focusing (the eyepieces do not move in and out like the Helios) this should keep the dust/sand out of them better.